So, OK, I've been watching a lot of the high school cult-favorite Freaks and Geeks lately. Set in a Detroit suburb in 1980, but airing for just one season in 1999 (my junior year, but somehow I totally missed it...I know, I know! ), this early Judd Apatow sitcom is quickly climbing into my top ten. It's no shocker if you've seen the show that I'm obsessed with the lead character Lindsay Weir. Mostly it's her cool girl personality, but also because of the fact that she wears her dad's military jacket every single day. It's mentioned in the show that the jacket is from the Korean War, so I did a little research. Looks like it's probably the M-1951 Field Jacket, issued from 1951-1965. There are a bunch available on Etsy and eBay if you're into vintage, but if you're not into vintage, Alpha Industries makes some great military reproductions including the M-65 Field Coat ($150) in both a regular and slim fit (the M-1965 was the M-1951's next and very similar iteration). Further browsing on Alpha Industries led me to this women's M-A1 flight jacket ($125), that looks pretttttty cool too. I think Weir would approve. I just picked up a similar style jacket from J crew in Navy. Love ! is your green army jacket the only thing keeping you warm tonight? I also just finished this on Netflix and can't work out how I missed it first time round. Freaks forever. That's the BEST show! My kids always tease my husband and me about Dad being the "Freak" and Mom, the "Geek" in high school. But we watch old episodes together and we ALL can relate. Her jacket reminds me that I used to wear my dad's old army jacket in jr. high (Cold War era). I have similar tan jacket from L. L. Bean and love it! 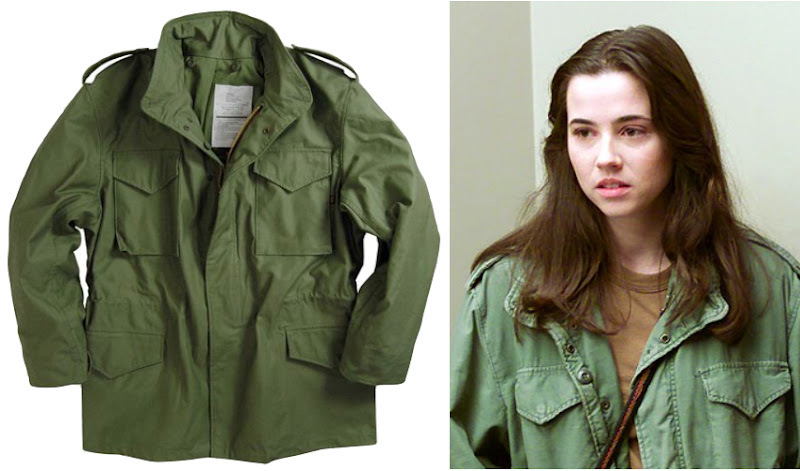 Oh, thanks--now I know that my beloved jacket is an M-1965 AND that it made a cameo in Taxi Driver! I wore one of these when I was in high school in the late '60s. Loved it. OH YEAH. Love me some Freaks and Geeks. I always though Lindsay was so cool. I got a military style jacket a long, long time ago and always felt like Lindsay Weir in it (I have longer dark hair as well). My newer military-green jacket doesn't have the boxy cut, but it's still my little shout out to Lindsay. I just like to give credit where due that Alpha Industries is not just some modern start-up making knock-offs, these are the real deal for those that like to seek out authenticity. I guess I should specify that it wasn't my personal M-1965 (although who knows!). But a little image search revealed the folded-over velcro sleeves on the one from Taxi Driver, as opposed to the straight cuffs from the M-1951. For a pacifist, I can get unexpectedly nerdy about old military uniforms. Thanks for clarifying regarding Alpha Industries. They're pretty new to me, but seem like a really dynamic and authentic entity.